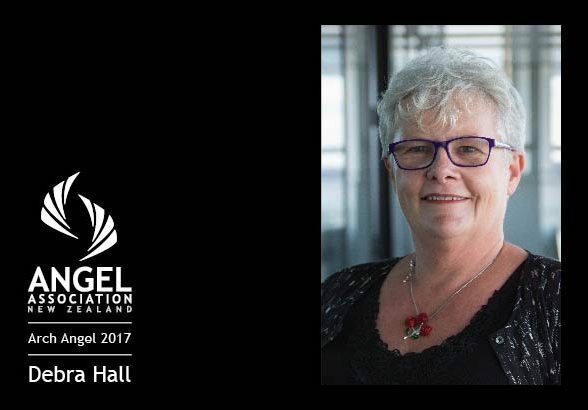 One of New Zealand’s most ardent angel investors, Debra Hall, has been awarded the Angel Association of New Zealand’s (AANZ) prestigious Arch Angel Award at the 10th Anniversary NZ Angel Summit on Waiheke Island. The Arch Angel Award is the highest honour in New Zealand’s angel investment community, and recognises individuals who reflect the qualities of the best angel investors and who are champions for the endeavour. Debra has made many investments in early-stage companies and been an investor director for a number of these ventures. She has held governance roles with Auckland-based IceAngels, the Angel Association itself and is currently an Advisory Board member for the first Chinese founded angel investment group, Zino Ventures. In 2015 Debra received IceAngels “William H Payne, Active Angel Award”. AANZ Chair and 2015 Arch Angel recipient, Marcel van den Assum, says Debra imbues all the qualities of a top-notch angel. “She is not only an active investor, contributing money and the deep expertise she has from scaling and selling her own market research company, but Debra also genuinely cares about the founders she backs, providing personal and practical advice which is a vital part of the more holistic role angel investors play,” he said. Marcel, who worked with Debra during her time on the AANZ Council, said her contribution to the angel investment in New Zealand is marked. Andy Hamilton, recipient of the 2011 award, has known Debra since she began angel investing in 2007 and said she had been a dedicated and invaluable member of IceAngels, renowned not just for her deal making capability but also for the lively dinners she and her husband Peter have hosted over the years for dozens of international visitors. Interviewed in Startup Young Company Finance Report’s October 2016 edition, Debra noted that she and Peter had heard about IceAngels through a connection who knew Andy Hamilton and subsequently received an introduction to the group. “In those days, from the outside, it looked to me like a secret society,” Debra said. She subsequently discovered that wasn’t the case – “all angels are very welcoming of new members and in fact eager to get new angels on board,” she said. It was in this article that Debra set out why she is so passionate about the role good governance plays in the success of angel-backed companies. “Governance is often seen as an inconvenience or intrusion by founders, however an effective board is actually critical to their success. With many of these companies, we’re dealing with a team that has never run a business before, so experienced directors are not just bringing classic governance to the table, they’re bringing their contacts, business experience and willingness to take on risks – often for minimal remuneration,” Debra pointed out. Debra received her award at the 10th Anniversary NZ Angel Summit, held at Cable Bay Winery on Waiheke Island and attended by 150 delegates. The annual event provides a hub for angels to learn and network, and is recognised as one of the world’s top angel events. South African born, Debra was that country’s first female metallurgical engineer. After immigrating to New Zealand, her career changed tack when she took on a job for a market research company that allowed her to work from home. She found a passion for the sector, leading her to establish the market research company Research Solutions in 1992. It grew into one of the country’s leading market research consultancies, and was sold to global market research giant, Synovate in 2007. She chaired the New Zealand Marketing Association for a number of years. Former Arch Angel winners also include The Warehouse founder and long-time angel investor Stephen Tindall; Andy Hamilton, chief executive of The Icehouse and member of IceAngels; US super angel Bill Payne; veteran angel investor Dr Ray Thomson; prolific AngelHQ member, Trevor Dickinson and current AANZ Chair, Marcel van den Assum.